For Where Your Treasure Is: Should I Give to Them? One thing many of us hope for as we move toward retirement is to have enough money to donate to good causes. One thing we do not want to do is to donate to charities that waste our money. If you have spent any amount of time on facebook, you've probably seen the meme that denigrates Goodwill and the American Red Cross and urges people not to contribute because of the size of CEO salaries, among other things. This article will give you some guidance about which groups should get your donations. Do you agree with the purpose of the organization, and how important is it to you? 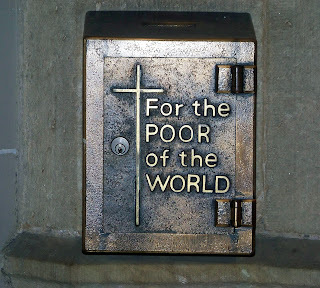 There are a lot of groups out there vying for our money, but most of us have only a limited amount to give. Make sure the groups to which you give your support are groups that support your values. I am pro-life, anti-abortion. I don't care what good someone says the local Planned Parenthood clinic does, the fact of the matter is that Planned Parenthood actively supports, and often provides, services I find morally abhorrent--that's a very public fact. On the other hand, I have no problem with "save the whale" campaigns, but they aren't high on my list of priorities either. I won't go out of my way to donate to save the whales, but I may give a small donation if approached by the right person. What is the purpose of the organization, and how good a job does it do? The purpose of some organizations is drawing attention to the cause. One way of doing so it putting on large public events, which also serve as fundraisers. If you look at the organization's balance sheet, you may see that they appear to spend a great deal of money on fundraising, but when you look more deeply you see that the fundraiser also served to publicize the issue. On the other hand, some charities just plain spend too much money on overhead. How does the size of the overhead compare to the size of the organization? The CEOs of national organizations with billion dollar budgets and thousands of employees get paid in six figures. Is that too much? The answer is simply, it depends--but probably not. Running the American Red Cross, an organization with branches in every state and many communities, is not a job for an idealistic fresh-out-of-college twenty-something. It is a job for someone with significant management experience who could easily get another job. How much money do you need to pay to attract the right person to the job, and to keep them there? That's the question to ask about salaries, not whether the CEO makes more than you do. If the organization is a local food pantry open a few hours per week and staffed primarily by volunteers that has a client base of one hundred families, then you don't want to see a large line-item for salaries. Can you donate to a particular project? It is easy to say "no" to a charity if you disagree with its goals and/or activities. To stick with my example, Planned Parenthood isn't getting any of my money if I can help it. It is easy to say "yes" to organizations you wholeheartedly support. My church gets a donation from me monthly and I don't try to micro-manage how they spend it as I support their whole mission and believe that in general they spend money wisely. However, there are times when you support particular projects of an organization but not the organization as a whole. 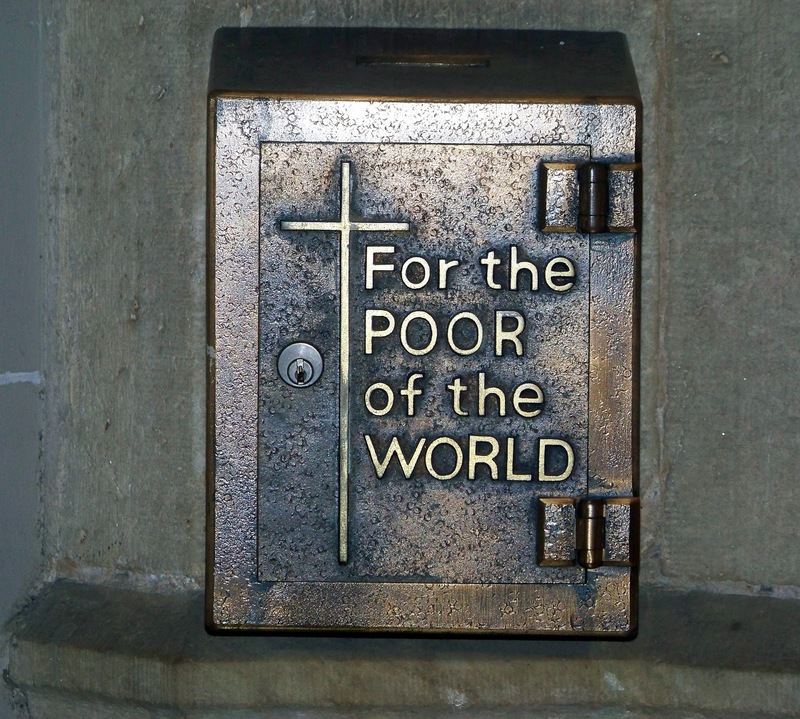 For example, you may be fine with donating to my parish's food bank, since you know the donated food feeds the poor who come to the door, no matter who they are, but be opposed to the doctrine of my church and not want your money spent to promote or spread that doctrine. Many organizations will allow you to direct donations in a meaningful way, and others allow it in a paper-shuffling way. You may support your alma mater but believe that the current administration is wasting money on foolishness while neglecting something you support. Most universities will allow you to direct your donation to a pet project or to scholarship, or will allow you to donate equipment. On the other hand, the United Way will allow you to direct donations but that is a paperwork exercise. The United Way accepts requests from member organizations, and creates a budget directing a certain amount of money to each organization. If I direct my donation to the Girl Scouts, it means they use my money to fill the Girl Scout's allocation. It does not mean that the Girl Scouts get more, unless so many people direct their donations to the Girl Scouts that it overfills the budget. The United Way allows me to opt out of supporting a particular group, but if I opt out of supporting XYZ, they will simply use your money to support XYZ and send mine to another group. The only way XYZ gets less money is if so many people opt out of supporting XYZ that there isn't enough money available to fill it's budget. How do I get information on an organization's spending? Most non-profits will mail you some sort of financial disclosure upon request. Guidestar has tax filings and other data. I now know that the CEO of Girl Scouts Louisiana East makes over $100,000 per year and that the average employee makes $18,000 per year (hopefully because there are a lot of camp counselors who are paid low wages for a short time during the summer who skew the average). Yes, you should. To what? To organizations that effectively work for causes you support, to those who make wise use of your money and to those that do those things in your community. If you generally support the mission of the organization, do a little research and make sure that the organization is effective and efficient. Last week I took a look at my Lending Club account and how it was doing. This week I'll examine my Prosper account. For those who don't know, both Prosper and Lending Club are Peer to Peer Lenders. They take applications from those who want to borrow money, review the applications and offer loans to those who qualify. The interest rate offered depends on the credit-worthiness of the applicant and the risk factors associated with the loan. Once that is determined, the loan is offered to investors who can purchase as little as $25 worth of the loan, either by personally reviewing data about the loan or by setting the computer to automatically invest any available funds in loans that meet criteria you have set. 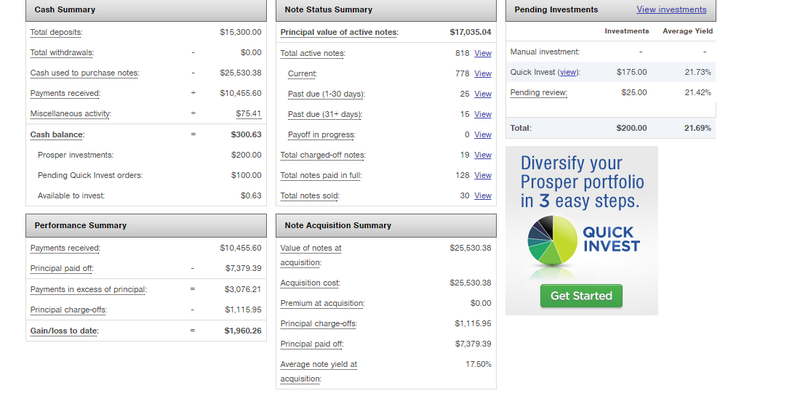 Here is a screenshot of my Prosper dashboard. You can see that Most of my money is in C, D, and E rated loans. You can see that if you look at all my notes, the annualized return is 13.39%, but that if you look at my seasoned notes--those that are more than 11 months old, the return is 12.88%. That is because the older a batch of notes gets, the more defaults there are. It is been Prosper's experience that once a batch of notes reaches 11 months of age, returns stabilize. The dashboard also shows you the annualized return by grade of my seasoned notes. As with Lending Club, the rate quoted above does not account for cash drag--money that is in your account buy not earning interest because it is not currently invested in a note (as of this minute that is $200, which is pretty typical for me). If you look at the increases in the value of my account the last few months, since the last principal infusion, and annualize it, you'll see that I'm earning about 6.6% annually. 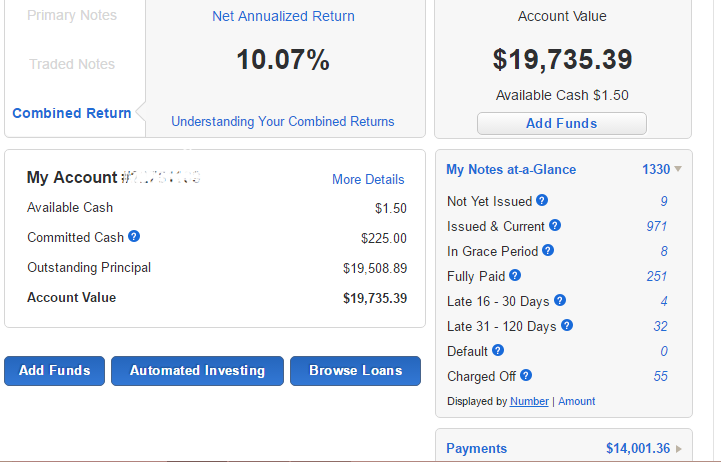 If you use the XIRR calculator on my account, the annualized return is 10.9% reflecting, as did the Lending Club calculations, that the effective rates drop as the accounts age. Still, whether 6.6% or 10.9%, it is more than I got in the stock market last year. This portfolio is made of all the notes I purchased in 2016. I have invested no new money in this account; all of these notes were purchased with the principal and interest paid to me each day. As of May 8, an account of about $19,000 has paid me over $4,000. That's a handy number to keep in mind if you want liquidity in an investment. Lending Club notes are not instantly liquid (though they can be sold on a secondary market) however, they regularly throw off cash, which you can choose not to reinvest. I use Lending Club's automatic investment feature to purchase equal numbers of C, D, and E rated notes. I filter the notes to get only those for debt consolidation or credit card payoff and to eliminate those where the borrow has other credit inquiries in the last six months. Lending Club projects that my return will be 7.38% annually. So far, none of these notes is late. I purchased all the notes in this portfolio new in 2014 and 2015. I used a lot of different criteria and tried to track them for a while but just gave up. It is the largest of my portfolios. I have lost 31% of the interest earned because of loan charge-offs. Lending Robot is a service you can use to pick notes for you. They will invest a certain amount at no charge; after that, they charge a percent of the money they invest for you. The advantages to Lending Robot are speed and its algorithm. Lending Robot's computers are able to log onto Lending Club's site, filter the available loans and select and purchase appropriate ones more quickly than even Lending Club's automatic investing system. If you are trying to deploy a large amount of money at one time, it can make a real difference. Also, Lending Robot and similar services crunch all the numbers on all the loans made by Lending Club and try to find weaknesses in Lending Club's underwriting. In short, they are trying to find loans which Lending Club overpriced--loans that are less likely to default than others with the same interest rate. If you invest via Lending Robot you can use your filters or theirs. This portfolio was designed by and picked by Lending Robot. I have lost 33% of the interest gained on this portfolio to charge-offs. Peer to Peer Quant was a website that purported to have a system for picking notes that were less likely to default and therefore would earn higher returns than other similarly-rated notes. The owners decided to shut it down, and said the returns were not enough better than average to justify keeping it. Interestingly, I have only lost 13% of my interest to defaults. 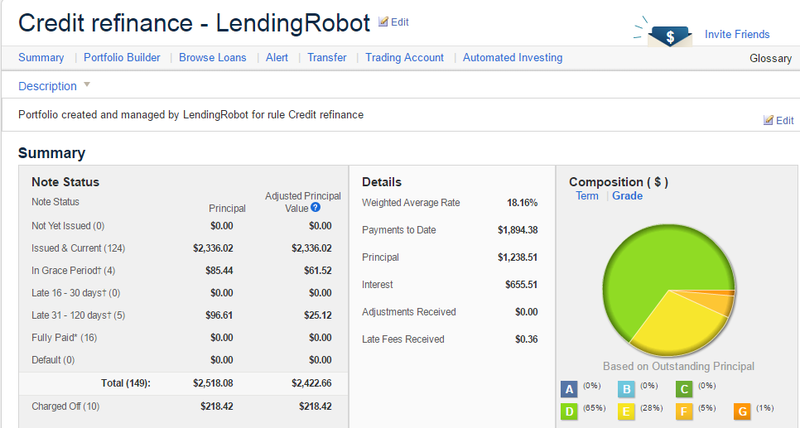 This is another Lending Robot portfolio. I have lost 30% of my interest for this portfolio. When I first started researching Lending Club I read articles that said that most defaults at least get started in the first year of the note's life. The borrower will be late for a payment, even if he later pays on time for a while. The borrower's FICO score will go down. The writer of what I was reading recommended buying high-interest notes that were at least a year old and which had perfect payment records. He also recommended avoiding those whose borrowers had FICO drops. The problem with such notes is that the owners generally know they have something of value, and charge a premium for it. When I bought these notes, I generally paid a premium with the attitude that if I made money, I had not problem with the first owner doing so as well. Unfortunately, I found that early pay-offs of these loans were not uncommon, and at 39%, this is one of the portfolio where defaults have taken the biggest chunk of my interest. Another article I read early on talked about a "penny notes" strategy. He recommended buying A or B notes with about a year left on them. It was his opinion that these were very unlikely to default. Since I was not sure about Lending Club, I liked the idea of getting my money back quickly in case I wanted it for something else. 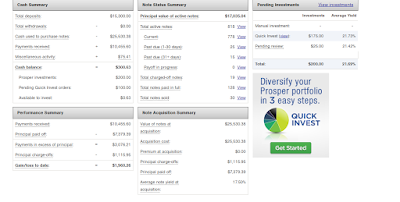 As you can see, there are 213 notes in this portfolio and 101 have been paid off completely. Seven have been charged off, so I have lost 39% of my interest to defaults so I don't think this turned out to be a "safe" way to invest. Do you invest via Lending Club? What are your returns? When I first heard of Lending Club, I searched high and low to find out how real people were doing with it. Can you earn a lot? What are a real person's Lending Club results? 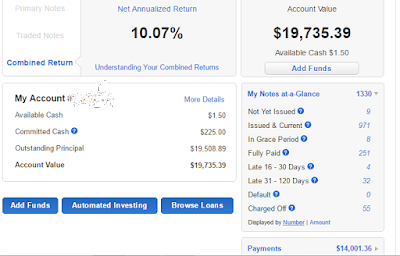 I have now been investing via Lending Club for about two years and want to let you know how much I earn from Lending Club. If you are not familiar with Lending Club's dashboard, let me use this time to explain this. You can see on the left that "primary notes" and "traded notes" are grey'd out. This means that my account contains both notes I purchased new and kept, as well as notes I either purchased from or sold to another user (I've done both). That 10.07% figure assumes that all notes not currently in default will pay the full amount owed on the date owed, an assumption that everyone knows is not true. Further, it does not take into account that you always have money in your account that is not earning interest. If you look at the chart above, at the time that screenshot was taken, I had $1.50 that was totally un-invested and $225.00 that was committed to notes but not yet invested, meaning that it was earning no interest. On the right side of the chart you can see that during my time with Lending Club I have purchased 1330 notes, or parts of loans. Of those, 9 are still being processed (and aren't earning me anything); 971 are current and paying, 8 are in grace period (less than 15 days late), 4 are between 16 and 30 days late, 32 are over 30 days late and 55 have been charged off as worthless (though Lending Club does sell them to a debt collector and will credit your account a little when that happens). As I said, the first figure assumes that all borrowers will pay as promised, and that everyone knows that isn't going to happen. This second figure shows Lending Club's estimate of what is more likely to be true. Their experience has shown that 10% of the value of notes which enter grace period is lost. Obviously, that is on an aggregate basis, not an individual one since most end up paying, just late but those few that don't are the reason for the drop. 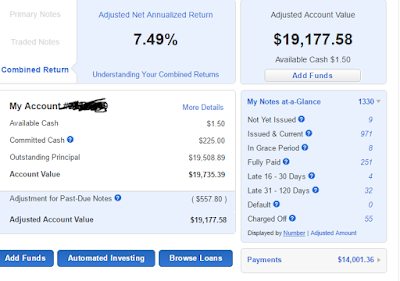 Based on the number of late notes currently in my portfolio, Lending Club estimates the real value of my account to be $557.80 less than shown in the first figure and estimates that my rate of return is 7.49% rather than 10.07%. However, even that figure is inflated as it does not take into account the cash drag--the money in my account that is not earning anything. Today's figure of $225 is pretty average; some days it is more (like if several people decide to pay off loans) and some days it is less. If you are adding or withdrawing principal, the XIRR method is considered the most accurate. You can use Excel to compute this (but don't ask me how) or you can use this online calculator. Using the adjusted values, it shows my returns to be 6.75%; using unadjusted values, my returns are 9.02%. In either case, this far exceeds my stock market returns during the same time. My account has grown from $17,050 to over $19,000. Why are the XIRR results so much higher than annualizing monthly returns as above? Because the first few months the returns are artificially high as defaults have not started to hit yet. For example I have one portfolio in which I keep all the notes I have purchased this year (2016). As of today, May 8, all are current; none are late. As these notes age, and some quit paying my overall return on that group of notes will fall. One thing Lending Club allows you to do is to divide your notes into "portfolios" and to therefore track different portfolios. 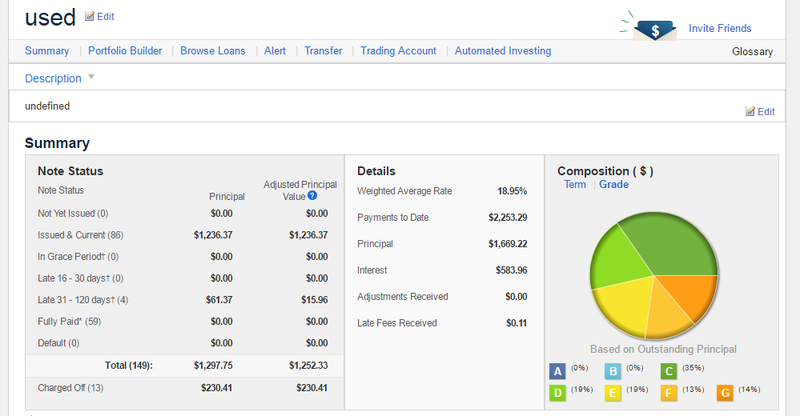 My next post will talk about my Lending Club portfolios.